Linda DeMaris loves to act but hasn't had much stage experience as her corporate career has taken center stage. As a senior HR leader her professional role provides her ample opportunity to take center stage as a workshop facilitator, leading meetings, creating and directing team building events, and making presentations to small and large audiences. She is presently in transition and plans to take a break from her currently corporate career track, thus allowing herself ample opportunity to re-engage in community theatre and other acting opportunities. After moving to Norcross 2 years ago, she has been thrilled to get more involved with community theatre and Lionheart Theater. How did you get involved with Lionheart Theatre? "My husband and I have gone to a number of productions at Lionheart over the years, even before moving to Norcross two years ago. Since moving here, we have attended most of the great productions at Lionheart. After auditioning for a part in The Adventures of Tom Sawyer, I was thrilled to be given the part of Aunt Polly. And most recently, I was the tour guide in the Lawless Spirits Tour." Linda DeMaris played Aunt Polly in Lionheart Theatre's production of "The Adventures of Tom Sawyer" earlier this year. What excited you about working on costumes for Miracle on 34th Street? "Miracle on 34th Street is my ALL time favorite Christmas movie. It is a holiday tradition around my house as my husband and children can attest. We (or maybe just me) generally watch it each year as we (or now just me) decorate for Christmas. Having watched the movie for the last 30+ years, I was very excited to be a part of the production. I did audition for a role, and while I was not selected to be on stage, I was thrilled to be asked to be the costumer for the production." Describe your costume design process. "There are 34 characters in the play--19 scenes in the first act and 14 in the second--spanning over multiple days with little time if any for the main characters to make reasonable costume changes. Therefore, my first step is to get organized, including a spreadsheet listing each character and each scene. This helps me understand who will be in each scene and what the costuming needs are for each. To get a feel for the era, I re-watched the Maureen O’Hara version of the Miracle on 34th Street movie and did a lot of Google image searches for the 1940's apparel. I invited the actors to attend one of two 'Macy’s of Norcross' shopping days at the Lionheart Theatre costume closet. One day we opened the women’s and children’s departments, and the next time we did the same for the men. We were lucky to find a number great costumes, including a Santa suit for Kris Kringle. We are filling the rest of our needs with items from the actors' own closets, Amazon/Ebay, and Goodwill. I will be altering any costumes as needed – adjusting lengths, adding elastic waist bands, etc. I even made some 1940's era shoulder-pads for a few of the more stylish female characters – such as Doris and the prosecutor, Ms. Mara." Are you required to attend rehearsals? "I attended the initial read through but have only been able to make a few rehearsals as I was working on another Lionheart production, Lawless Spirits Tour. I will be attending more rehearsals going forward, especially as we get closer to the costume parade to allow time to make any additional alterations or find other missing pieces." What has been the most interesting part of costuming Miracle on 34th Street? "While we can generally find styles that will work for a 1940's era production, it seems that bras have changed the most. In the 40's, bras were more pointy and now called 'bullet' bras. In an aim to keep to the 1940's era, we have asked a couple of our more 'more stylish' main characters to purchase these style bras, which can still be found." 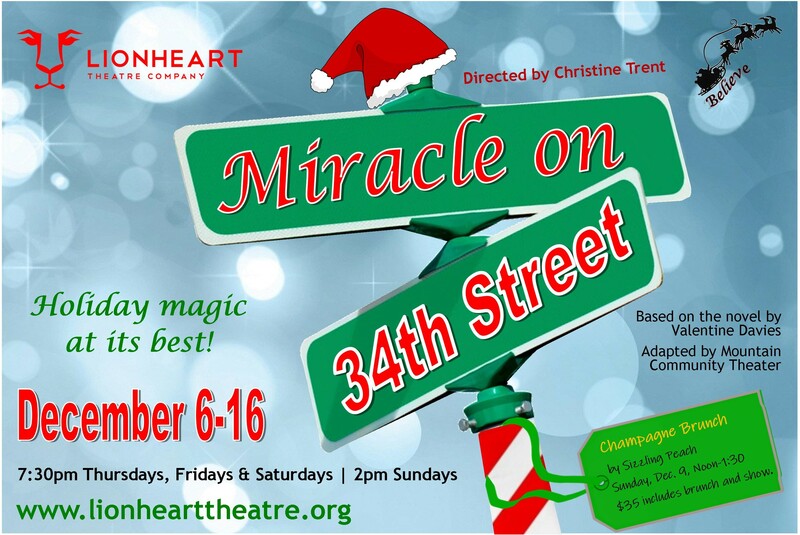 Don't miss the wonderful costumes by Linda DeMaris in Lionheart Theatre's Miracle on 34th Street, playing December 6-16 in downtown Norcross. Performances are Thursdays, Fridays and Saturdays at 7:30pm and Sundays at 2pm. Please visit http://bit.ly/2NlrEo0 for tickets and more information.